Retainers of Anarchy is a solo exhibition featuring new work from Howie Tsui that considers wuxia as a narrative tool for dissidence and resistance. Wuxia, a traditional form of martial arts literature that expanded into 20th century popular film and television, was created out of narratives and characters often from lower social classes that uphold chivalric ideals against oppressive forces during unstable times. The people’s republic of china placed wuxia under heavy censorship for fear of arousing anti-government sentiment. However practitioners advanced the form in Hong Kong making it one of the most popular genres of Chinese fiction. The title work, Retainers of Anarchy, is a 25-metre scroll-like video installation that references life during the song dynasty (960–1279 CE), but undermines its idealized portraiture of social cohesion by setting the narrative in Kowloon’s notorious walled city—an ungoverned tenement of disenfranchised refugees in Hong Kong which was demolished in 1994. An interactive sound sculpture in the form of a wooden kung fu training dummy (mook jong) that catalogues martial arts techniques based largely on Hong Kong novelist Jin Yong's The Condor Trilogy. The audio component is created through motion sensors producing percussive knocking patterns. 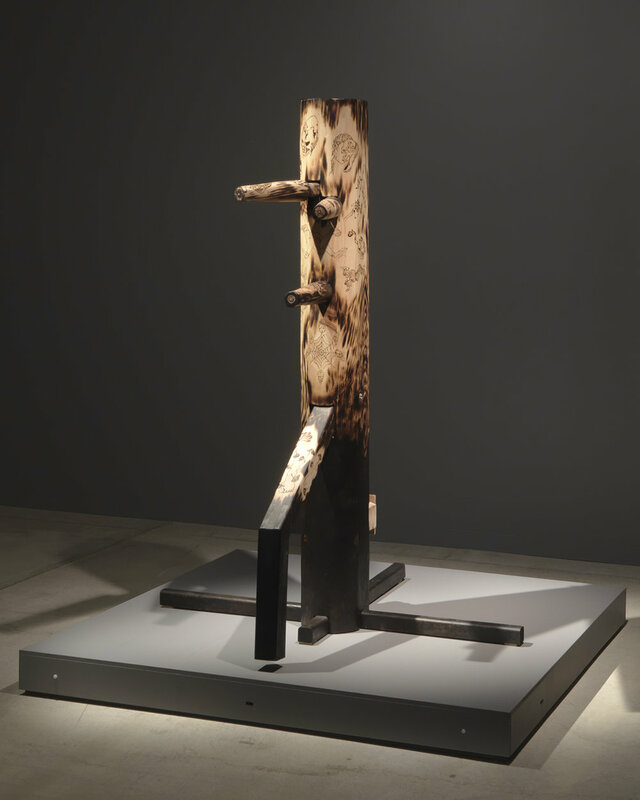 Based on Steve Reich's Music for Pieces of Wood, the sound references both the wooden fish used in Buddhist mantras and the clacking produced when a martial artist trains on a wooden dummy. Akin to tattoos, the etchings on the sculpture highlight the variety of clans and sects that inhabit the wuxia universe, serving as a graphic taxonomy of the tribes within the genre. 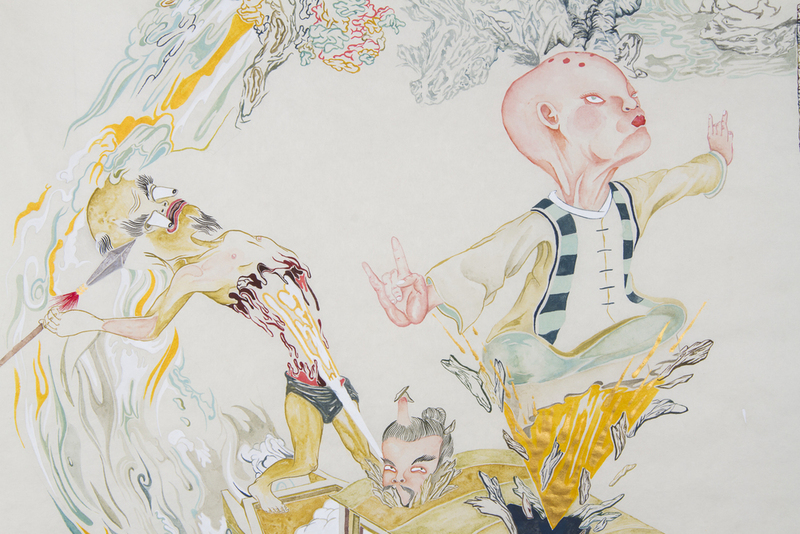 The work conjures a meditative space that alludes to hermetic chambers frequently portrayed in wuxia (enclosed spaces for internal training and spiritual enlightenment); and draws parallels to an isolated artistic studio practice.